If you’re used to the live action of playing roulette in a land based casino, it can be daunting to make the move to playing online roulette. 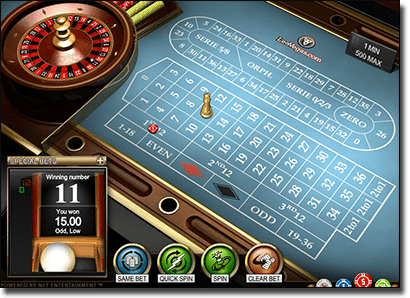 Fear not of these unchartered waters, as online casinos offer free roulette games to allow you to familiarise yourself with this exciting new form of gambling before committing yourself to any real money wagers. Head to any of our recommended casinos and you can try freeplay roulette for yourself. Free-play, also known as practice play, is an online casinos way of letting you ‘try before you buy’, allowing you to sample the range of online roulette games the venue has on offer without risking any of your own money. You can demo free roulette games instantly in browser-based mode, which means you don’t even need to download any software or register for an account with a casino to play. Playing roulette for free gives you full access to the games, providing an exact sample of what’s in store if you do choose to play the game for real money bets. There’s no risk, no commitment and it provides a great platform to hone your roulette skills or simply to play for leisure rather than money. Can I win money from free play credits? The only downside of free play roulette is that with no risk, there can be no reward. Playing for free allows you to place high wagers on bets with low odds, but unfortunately you can’t win any real money this way. The demo roulette game will keep a tally of all your pseudo-winnings, so you get a glimpse into how things might go if you decide to move onto real money wagers. Signing up for a new account with any of our recommended casinos will also give you some free credits to play with. New players receive welcome bonuses in the form of matched deposits or no deposit bonuses which you can then use to give real money roulette a spin. Can I play live dealer roulette in practice mode? Guts Casino – close to 20 practice play roulette games to choose from, by leading software developers like Microgaming, NetEnt and BetSoft. G’day Casino – the only site with free play live dealer roulette, plus sign up and you’ll receive a free carton of beer! Royal Vegas Casino – you can try freeplay roulette games at Royal Vegas using browser-play, by downloading the premium casino software or getting the RVC app for iPhone or Android mobile devices. Leo Vegas – along with a great desktop site, Leo Vegas has one of the best mobile casinos going around, with 10 mobile optimised roulette games available for free play. 32 Red – sign up and you’ll receive $10 for free, so you can move on from practice play to real money bets without risk to your wallet. Follow our links to enjoy freeplay roulette at any of these safe SSL (Secure Socket Layer) encrypted venues and new players will also receive some hefty welcome bonuses.